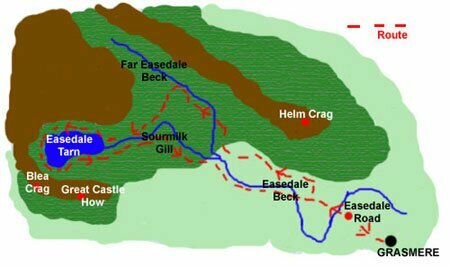 It is recommended that you console your map of the area you intend to walk in for the correct route as the walks mentioned are an overview. A very popular walk which can give you a feel of being in the mountains. An easy walk to follow but with a steep climb to Easedale Tarn itself with some rough ground on the descent. Turn left from the car park and take the first right Easedale Road continue up the road passing the sign Youth Hostel going to your right. On the bend of the road you will see a sign saying Easedale Tarn on your left and a footbridge ignore this and continue on the road past Lancrigg Hotel and you will enter into a field. Passing a few houses you will arrive at a fork, go right [signed Far Easedale & Helm Crag] on a rough track leading up to a metal farm gate. Through the gate and bear left to another fork in the path and go left [signed Far Easedale & Borrowdale]. The path will lead you between drystone walls and across some fields to some barns. Passing the barns you will arrive at Far Easedale Gill continuing on the path you will arrive at a footbridge, cross over the bridge you will arrive at another fork in the path [40m/43yd] take the left fork and you will begin to ascend steeply and pass a split boulder and a footpath marker. You will climb to the top of the field on your left and onto some more footpath markers and you will start to go right slightly arriving at Sourmilk Gill keeping to the path around the boggy land you soon arrive at Easedale Tarn. From here you, circle the tarn arriving back at this point to where you will descend back down this time going down Sourmilk Gill. The route from here is straight forward but care is required underfoot. Eventually you will arrive at a stone wall and go through the kissing gate which then joins a farm track across the fields. Keeping to the track and entering through a metal gate and into another field. On reaching the concrete bridge go through the left gate which takes you alongside Easedale Beck which in-turn takes you into the woods to the footbridge. Over the footbridge and you are back at Easedale Road, turn right and follow the road back to Grasmere to the car park. If you would like to submit pictures or a link to your site and to advertise please do Please Contact Us.